Extra large bedpan features a tapered front so that it slides easily under immobile patients. Can also be used as a bariatric female urinal. Loop handle makes maneuvering easy. Also available in pigment-free to support "greener manufacturing". 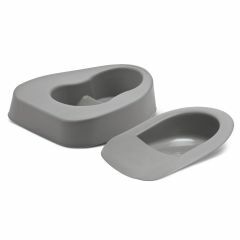 AllegroMedical.com presents The Bariatric Bedpans. Extra large bedpan features a tapered front so that it slides easily under immobile patients. Can also be used as a bariatric female urinal. Loop handle makes maneuvering easy. Non-stick surface. Also available in pigment-free to support "greener manufacturing".